A student walks past a sculpture made of empty water bottles on the University of Vermont campus. UVM has banned the sale of bottled water. "It's much more convenient to fill up your water bottle at a water fountain than to buy bottled water," says Mikayla McDonald, a recent graduate, who a few years ago helped to launch the campaign that led to UVM's ban. McDonald hopes it will reduce waste. But for her, it's not just about changing behavior on campus. "Bottled water is a symbol of our culture's obsession with commodifying things that should be public trust resources," she says. In that spirit, a few other American colleges have restricted or banned the sale of bottled water to promote sustainability. But the University of Vermont is the largest public institution to do so, and that development disappoints beverage companies. "I think they're concerned because it's such a radical step," says lobbyist Andrew MacLean, who represents local water and soft drink distributors in Vermont. He agrees with the students' environmental goals, but he thinks an outright ban restricts free choice and will ultimately fail. "The factors that will result in more materials getting out of landfills is going to be a cooperative effort promoting strong recycling," he argues. 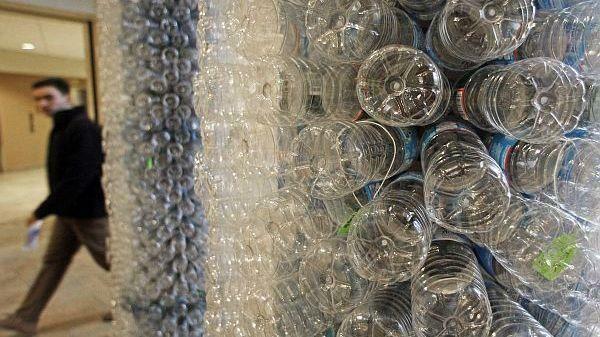 But at least one New England town says recycling isn't enough to keep plastic bottles out of its waste stream. Concord, Mass. — perhaps best known for its role in the American Revolution — joined the student movement this month, outlawing the sale of single-serve plastic water bottles in its stores. When students at the University of Vermont's Burlington campus resume classes today, one thing will be missing: bottled water. Vermont Public Radio's Kirk Carapezza reports that UVM is just the latest school to ban the sale of bottled water for environmental reasons. KIRK CARAPEZZA, BYLINE: At one of UVM's recently retrofitted refill stations, students fill up their reusable bottles with tap water. For many of the 14,000 students and staff on this campus, topping off their Nalgenes is an old habit. MIKAYLA MCDONALD: It's much more convenient to fill up your water bottle at a water fountain than to buy bottled water. CARAPEZZA: That's Mikayla McDonald. She's a recent graduate, who a few years ago helped to launch the campaign that led to UVM's ban. McDonald hopes it will reduce waste. But, for her, it's not just about changing behavior on campus. MCDONALD: Bottled water is a symbol of our culture's obsession with commodifying things that should be public trust resources. CARAPEZZA: In that spirit, a few other American colleges have restricted or banned the sale of bottled water to promote sustainability. But the University of Vermont is the largest public institution to do so - and that development disappoints beverage companies. ANDREW MACLEAN: I think they're concerned because it's such a radical step. CARAPEZZA: Lobbyist Andrew MacLean represents local water and soft drink distributors in Vermont. He agrees with the students' environmental goals, but he thinks an outright ban restricts free choice and will ultimately fail. MACLEAN: The factors that will result in more materials getting out of landfills and that sort of thing, is going to be a cooperative effort promoting strong recycling. CARAPEZZA: But at least one New England town says recycling isn't enough to keep plastic bottles out of its waste stream. Concord, Massachusetts - perhaps best known for its role in the American Revolution - joined the student movement this month and outlawed the sale of single-serve plastic water bottles in its stores. For NPR News, I'm Kirk Carapezza in Vermont. Transcript provided by NPR, Copyright NPR.